Boy band GOT7 will drop its third full-length album "Present: You" in mid-September, its management agency said Thursday. The release of the new album on Sept. 17 comes after the septet has recently wrapped up a world arena tour that brought them to 17 cities across the globe. 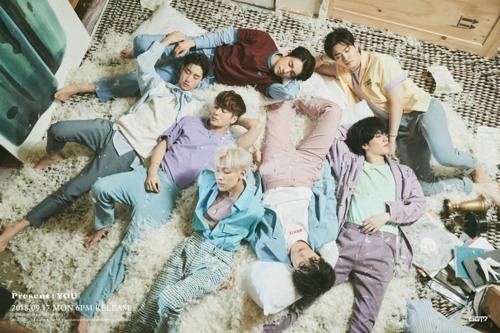 Through GOT7's SNS accounts Thursday, JYP Entertainment released two teaser images for the upcoming record, showing the seven members in cotton candy-color outfits and huddled together on a fur-strewn carpet. "The new album carries a meaning that the best present of the life of GOT7 is you, the fans," JYP said, adding the album is dedicated to expressing GOT7's gratitude toward fans. The album marks the second EP issued after the band's previous one "Eyes on You" in March.